Radiohead's 'In Rainbows' Sets Its Own Terms Even without all the fanfare about the download-only delivery, the release of Radiohead's In Rainbows is an event. Even after just a day's listen, there's already astounding music here. 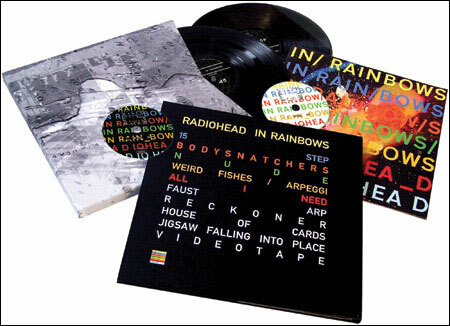 Radiohead's seventh studio album, In Rainbows will be available as a deluxe box set (shown above) in December, but right now it's only in digital format. Today, Radiohead made its seventh studio album, In Rainbows, available on the Internet. The 10-song work is the British bands first new release since it separated from Capitol Records, the label that promoted Radioheads music for more than a decade. Its also the bands first full attempt at e-commerce. Rather than setting a fixed price for the download, Radiohead invites fans to pay whatever they think the music is worth, without using any of the digital-rights-management software favored by the major labels. Even without all the fanfare about the download-only delivery, the release of In Rainbows is an event. Its new music from one of the most consistently creative rock bands of the last decade. On everything it's done since the 1997 landmark OK Computer, the British band has challenged its listeners to think about rock music in more expansive terms. Sometimes working with samples and beatboxes, it has cranked out rhythms that are light years from the typical rock backbeat, like the hiccupping agitation of 15 Step, which begins the new album. At the same time, Radioheads music has serious layers of texture, unexpected chord changes and a sense of orchestration that can sweep you up into its grandeur. The spectacular swirls of guitar dissonance that drive Bodysnatchers could have been inspired by a Jackson Pollock painting. Radiohead has been playing these songs live for the last few years as works in progress. Its a different approach for the band, which has typically developed its new music in the studio. Over the course of the tour, some of these pieces underwent multiple revisions. Others, like Jigsaw Falling into Place, became more focused — and, come to think of it, much of this record feels more streamlined than the last Radiohead studio album, Hail to the Thief. With a band like Radiohead, its not always wise to trust the first impression. Ive heard In Rainbows only a handful of times. Thats not enough time to decide whether its a masterpiece or a holding pattern for this band, or something in between. But it is enough to know this much: Theres some astounding music here.